Today is the third Friday in September, which is a special holiday in our country known as National POW/MIA Recognition Day. It is observed across the nation on the third Friday of September each year. Many Americans take the time to remember those who were prisoners of war (POW) and those who are missing in action (MIA), as well as their families. 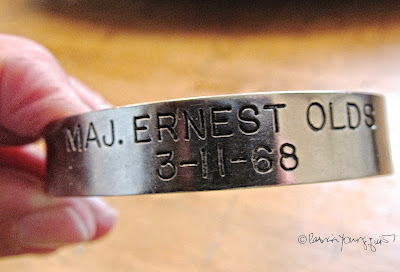 I still have a POW bracelet that has the name MAJ. ERNEST OLDS 3-11-68 inscribed on it. I bought the bracelet when I was working as a busgirl while in high school. The date 3-11-68 indicates the day Major Ernest Olds went missing. 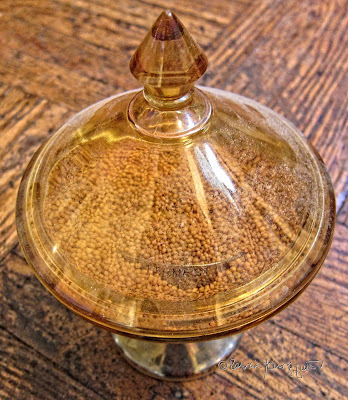 I first wrote a blog entry about my having this bracelet in May of 2011; and I included the image atop this entry that shows where I store it, which is in a candy dish that belonged to my grandmother. It is now filled with mustard seeds (as seen in the image atop this post) that nearly bury my bracelet. How funny...nearly one year after this blog was posted, For no reason whatsoever, I am rummaging through my dresser and find the POW bracelet I had from the 1970's. 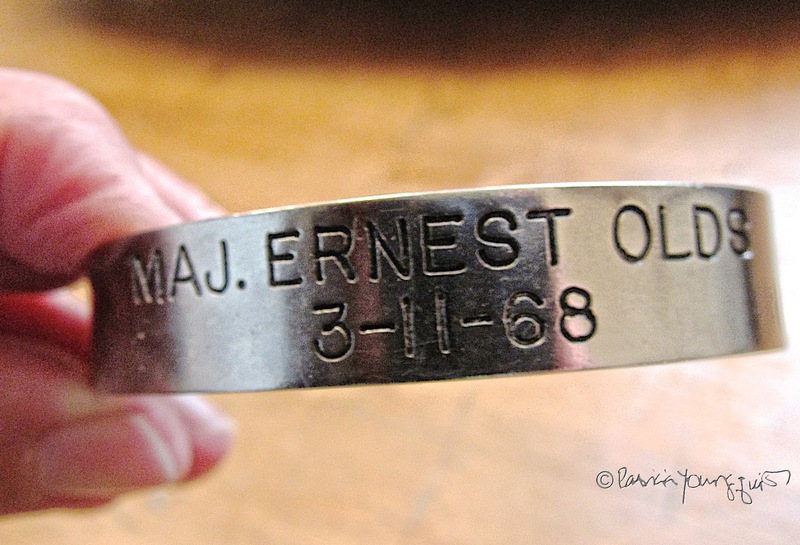 I decide to 'google' the name on the bracelet and find that I am not the only one who holds on to the POW bracelet of Maj. Ernest Olds, 3-11-68. Thank you Maj. Olds for your service to our Country. Wow, this brings tears to my eyes, Anonymous! The chances of us still having Major Ernest Olds' bracelet! 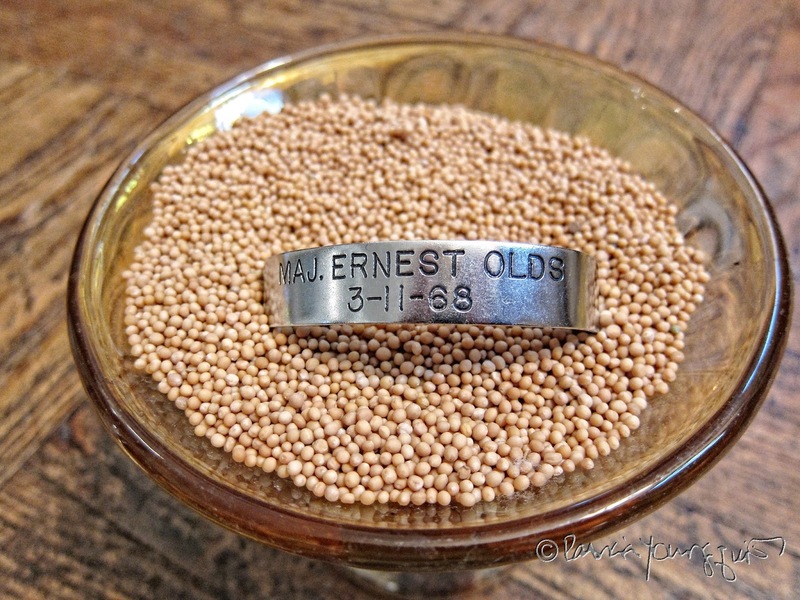 The fact that we have POW bracelets bearing Major Ernest Olds name would probably mean something to any surviving family members. I wonder if they ever found out what happened to him. I too thank Major Olds for his service to our country, and I pray his family is at peace. The latter of the aforementioned correspondence was also in 2013. In 2014, I reached out to Ernest Old's brother again, this time to honor the birthdate of Ernest Olds which is July 14, 1934, but I have not done so since that time. People have busy lives and I don't want them to be sorry that they contacted me. It has been over two years since the great niece of Ernest Olds reached out to me, and this past Saturday, September 10th 2016 — the eve of the fifteenth anniversary of the September 11th terrorists attacks, I got a message on my Facebook Page from someone who had come across my first blog post re Major Ernest Olds! She didn't know him, but she also happens to have a bracelet that has his name inscribed on it. I was able to fill her in (via Facebook messaging). Now, on this POW/MIA Recognition Day, I'd like to ask you, dear reader, to take a moment to honor those who are or were POWS; those missing in action; and of course those who are near and dear to them." As I've just stated, the passage I've just referenced is from my 2016 blog posting that paid homage to National Pow/Mia Recognition Day. I really don't have more to add at this juncture, except to reiterate my 2016 request: "Now, on this POW/MIA Recognition Day, I'd like to ask you, dear reader, to take a moment to honor those who are or were POWS; those missing in action; and of course those who are near and dear to them." Where are you, Wednesday's Wisdom? 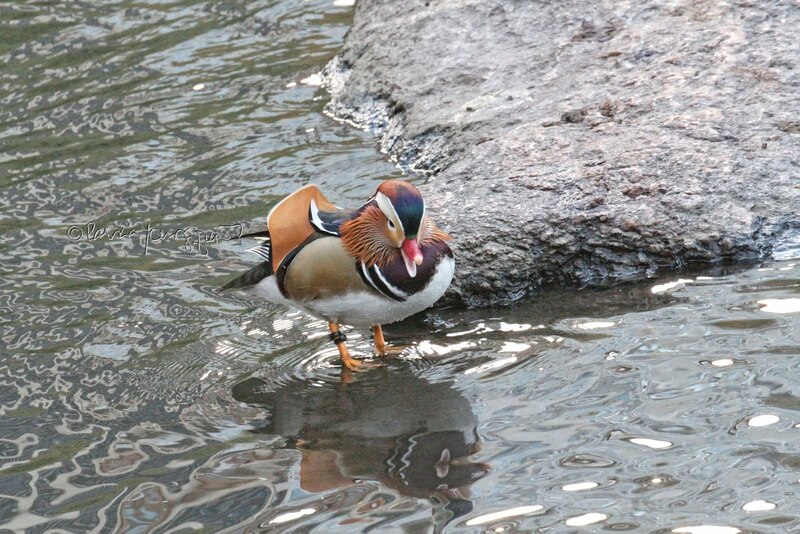 They had me at American Oystercatcher! 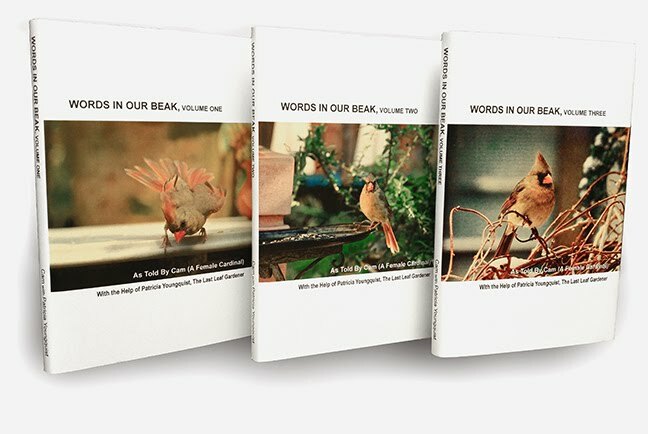 Thursday's Thoughts: Trust Mary Oliver's "Rx"